Fall 2008: We have survived another harvest! Given the heavy frosts in Spring we had a pretty good harvest. Our overall production was about 80 to 85 percent of "normal". This translates to over 176,500 pounds of fruit being picked, packed and sold. Connie and Becca decided to have a little fun. 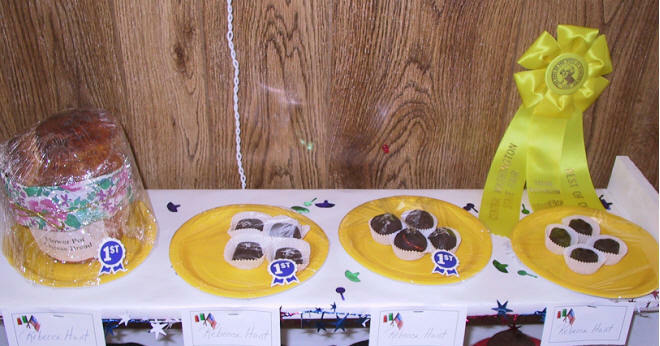 They entered some of their homemade goodies in the Central Washington Fair. Connie entered her pecan tassies, chocolate lovers cookies and her famous apple pie. Becca entered her black forest truffle (chocolate with dried cherries), chocolate dipped caramels, key lime truffles, and flower pot cheese bread. 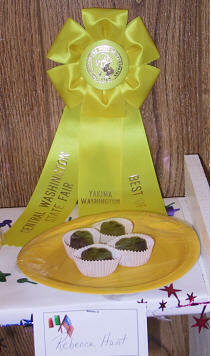 All seven of their entries won ribbons! Connie received three blue ribbons, and Becca received three blue ribbons - plus her black forest truffles earned a best of class gold ribbon! They were very excited with their victories and have already started thinking about what to enter next year. Connie's apple pie, pecan tassies and chocolate lovers cookies. 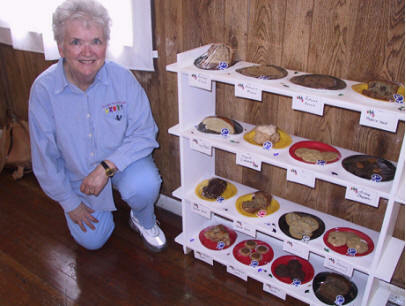 Connie with her entries (bottom shelf) at the fair. Becca's Best of Class truffles & ribbon. Becca's flower pot cheese bread, caramels, key lime truffles and black forest truffles.